As Children’s Book Week draws to a close, we wanted to highlight some of the incredibly talented children’s book writers and illustrators who have called Ohio home. Although we don’t have room to list everyone here, you may want to check out the Newbery and Caldecott winners and honorees listed below. Some are classic, some are contemporary…all are great. Robert McCloskey was born on September 14, 1914 in Hamilton, Ohio. As a child he liked music and electronics; his interest in art surfaced later when he began creating illustrations for his high school yearbook. After studying art in Boston and New York, McCloskey initially struggled to make a living as an artist. After a conversation with a children’s book editor, he returned to Ohio and based his first book, Lentil, on his experiences and observations there. Many of his other books were also based on places where McCloskey lived, including Make Way for Ducklings (set in Boston, where he attended art school) and Blueberries for Sal (set in Maine, where he lived with his family). McCloskey was the first two-time winner of the Caldecott Medal for children’s book illustration, and won two Ohioana Book Awards: in 1949 for Blueberries for Sal and again in 1958 for Time of Wonder. 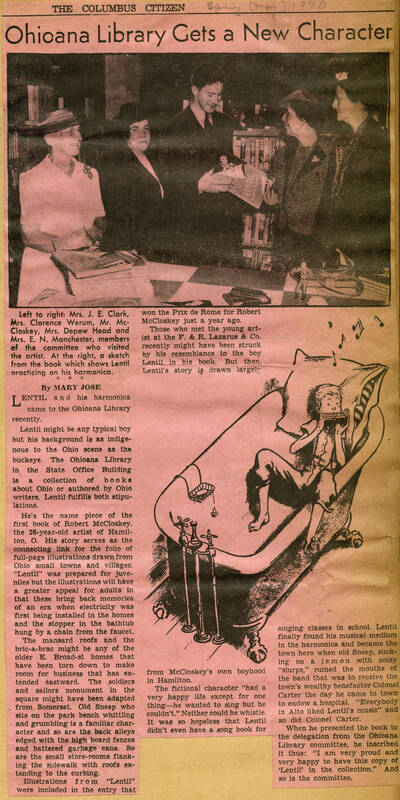 The newspaper clipping above from The Columbus Citizen describes McCloskey’s visit to the Lazarus book shop in May, 1940 to promote his first book, Lentil. 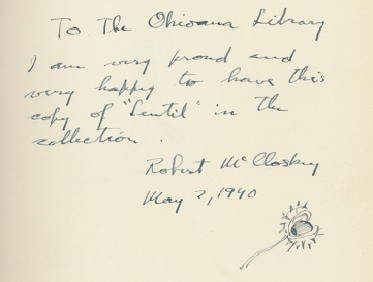 The image shows McCloskey presenting an inscribed copy of the book to Ohioana’s director, Florence Roberts Head. The inscription is shown below–complete with a buckeye!